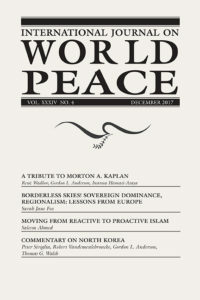 Many emotional labels or stereotypes are imposed on others to distinguish “good” and “bad.” Labeling a group a “terrorist group,” a “radical group,” a “racist group,” a “hate group,” a homophobic group,” an “extremist group,” or countless other terms, is a way of calling others the opposite of your group. Such labels cause social division and are used to justify tribalism, revolution, and government repression. They are a linguistic tactic used to deprive others of equal rights. 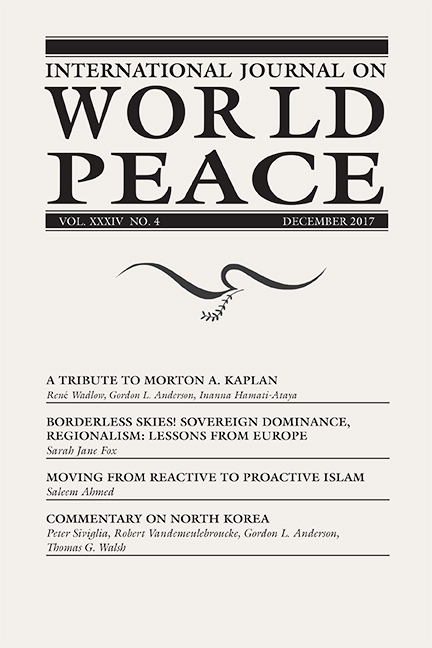 The mass media often reports on these divisive and fearful labels because they sell “news.” People who normally consider themselves good, moral, and peaceful can be swept up into this group division and end up supporting acts of violence against members of enemy groups that they would never normally consider perpetrating on another individual in their own group. Reinhold Niebuhr poignantly initiated an academic discussion about this problem in his book Moral Man and Immoral Society (1932). Social science research methods are able to produce verifiable knowledge about society that is more reliable than the seemingly arbitrary suppositions of religious traditions based on prophetic revelation or sacred texts, or on ideological belief systems based on other suppositions. 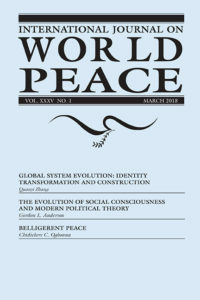 Auguste Comte, “father of sociology,” proposed a threefold view of the evolution of social consciousness: (1) the theological stage, in which gods and spirits control our fate, (2) a metaphysical stage, in which existence is governed by laws and processes that can be described by rational abstract thought, and (3) a “positive” stage that is based the scientific method. “Positive” implies more certain and verifiable truth: truth as something that is known rather than belief based on suppositions or claims. Only people over 75 years of age can remember a world without nuclear weapons—a world before humans could end life on earth as we know it in a few hours. The possession of nuclear weapons by a few poses a threat to all. During the Cold War, the nuclear weapons race between the United States and the Soviet Union was rooted in a doctrine appropriately called MAD (Mutually Assured Destruction). This doctrine was based on the idea that possession of enough nuclear weapons to kill everyone in an enemy country would deter that country from attacking. But since nuclear weapons can still be used for offense, people will still feel threatened. The only way to guarantee survival after a nuclear war would be to spend years in a bunker underground, undersea, or somewhere away from Earth until the radiation levels drop. The desire for social change has many times led to revolutionary fervor and the excitement for quick destruction of the old order, with the belief that society will magically change when dictators and corrupt social institutions are destroyed. But often the destruction of the social order that exists, corrupt as it may be, leads to anarchy, insecurity, poverty, refugees, and death. Last year International Journal on World Peace published several articles on the Arab Spring and the Bolshevik Revolution that showed how this recently happened in Syria and Libya, and how similar dynamics played out after the Russian revolution. Tunisia, on the other hand, the country that inspired the Arab Spring, did not go through revolution but experienced an evolutionary process where social institutions were constructively transformed. 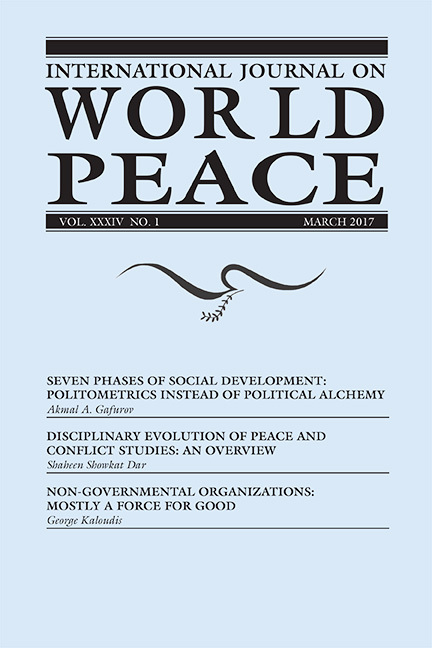 In our March 2017 issue, Akmal Gafurov proposed that social development occurs when constructive elements in a society outweigh the destructive elements so that social change can be positive rather than negative. 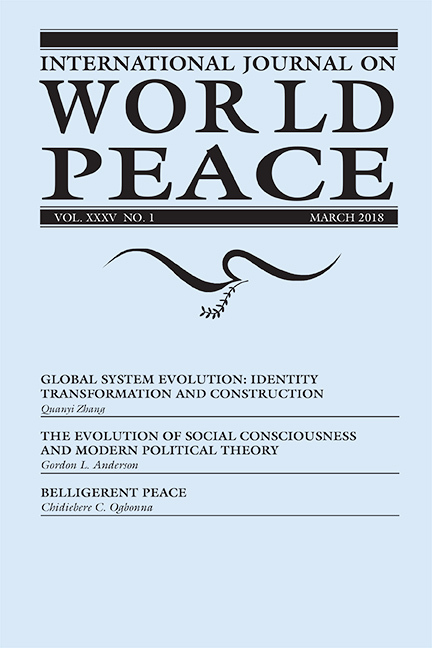 In the first two articles of this issue we look at the nature of the development of consciousness that affects both the destructive and constructive forces and the development of the modern state and global society. This year marks the 60th Anniversary of the Rome Treaties that created the European Economic Community (EEC). 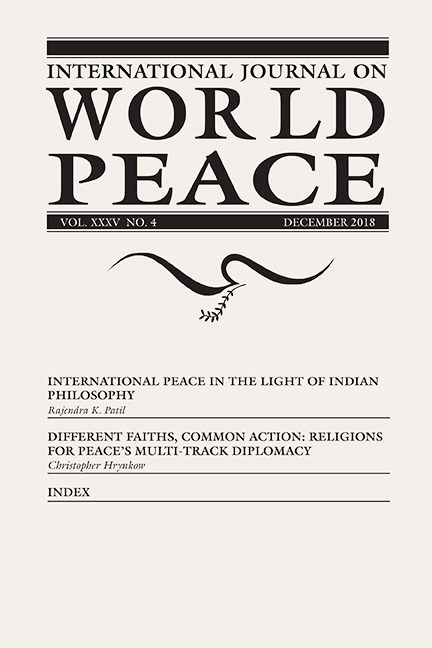 Since the origins of the nation-state system with the Peace of Westphalia in 1648, it has been a long arduous path towards a stable and peaceful international system. The process, which began in Europe as a treaty among warring kingdoms, led to an international state system represented by the United Nations. But the idea of the nation-state is foreign to traditional societies and empires, and perhaps not appropriate for modern pluralistic societies. The original concept of the nation-state involves the idea of a king deciding the national religion or value system that applied to all residents on his territory. The idea of a religious system coterminous with a territory is not new. Egypt, Babylon, Israel, and Rome all had national gods that guided and protected their societies and who were worshiped in temples. Then in 380 ad, Emperor Theodosius I of Rome made Nicene Christianity the official state church of the Roman Empire. The relationship of church and state was often contentious, with popes and kings vying for supremacy. The Reformation, spearheaded by Martin Luther and John Calvin, led many kings and princes to adopt new denominations of Christianity they considered better. And, in 1534 ad, Henry VIII in England created a national church for England. When the Peace of Westphalia was signed, every state had an official religion. The King provided security and the religion provided the cultural value system. 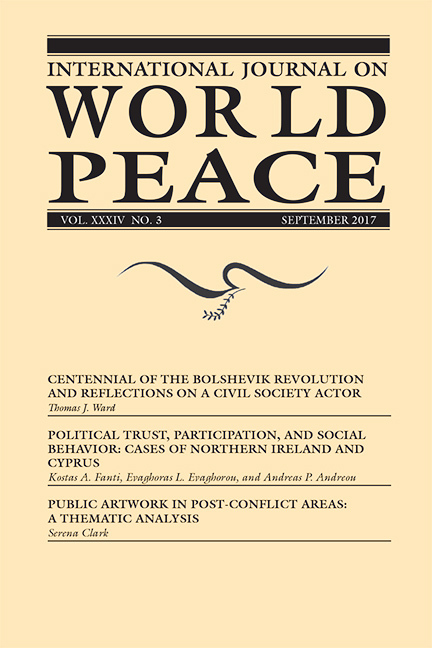 This issue of IJWP coincides with the 100th anniversary of the October Revolution in Russia in 1917. In 19th century Europe, there had been a large-scale industrial revolution created with capital investment that produced massive amounts of goods. Heavy industry produced steel for railroads, ships, and other products that dramatically transformed traditional societies rooted in agriculture, family, and local communities. This social transformation affected businesses, jobs, and lifestyles as much as the internet and smartphones have transformed society and the economy today. 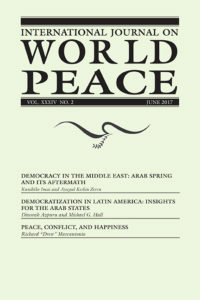 This issue of IJWP focuses on the prospects for democracy in the Middle East. The larger question behind this is whether democracy is the most desirable form of government for the Middle East, or for anywhere else in the world. 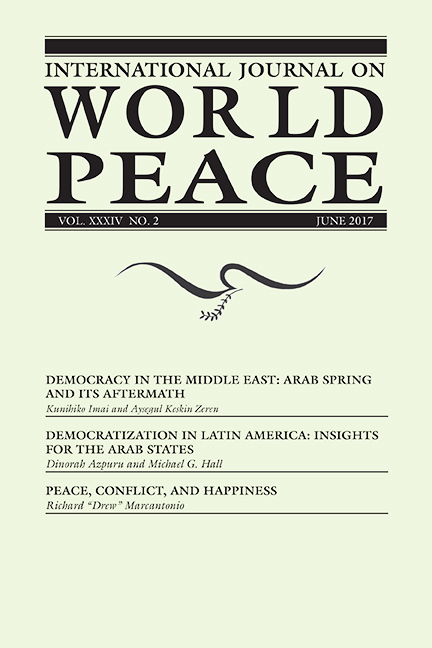 In the March 2017 issue, Professor Gafurov argued that democracy is a stage in social development that is higher than rule by dictatorship, the most common form of government in the Middle East. 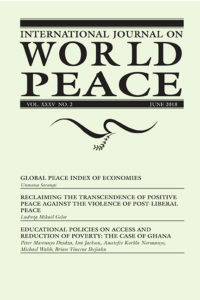 In the mathematical model of social and political development that he described, societies require large segments of the population that are morally constructive (M) and economically self-sufficient (E), and that democracies require a large number of middle-class owners and a vibrant civil society. Democracies require people who largely do not rely on government for anything except freedom and security. The Middle East countries whose economies are based on the sale of oil, whose oil proceeds are distributed through the state, do not have large numbers of citizens who are economically independent from the state—an E deficit. The religion of Islam, to the extent it promotes ritual and obedience, rather than creative inquiry, would mean an M deficit. These factors argue against the possibility of achieving democracy in the Middle East any time soon. The application of systems theory to social development has not been popular in political science for decades. Strategic thinking and conflict resolution have dominated, perhaps because they are employed to achieve immediate goals. But the refugee crisis created by the “Arab Spring” has forced some to conclude that a benevolent dictatorship is a precondition for democracy, and that toppling dictators and holding elections only brings anarchy and terror. 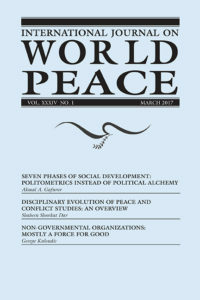 This issue of International Journal on World Peace examines social development and the idea that creation of more democratic societies, or even academic fields like peace and conflict studies, is evolutionary, rather than revolutionary. 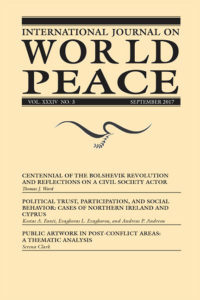 In this issue of International Journal on World Peace, three articles probe the creation of peaceful and legitimate states. Since the rise of modern democracies, people have believed that having elections would make states legitimate because every citizen would have a right to participate in governance. Such simple views fail to ask whether (1) the governance system gives all groups access to power, or (2) whether people are capable of voting as responsible citizens. The recent events related to the “Arab Spring” began with euphoria and largely ended in despair as violence, starvation, and millions of refugees were the product of what was intended to be a transition to better Arab societies. 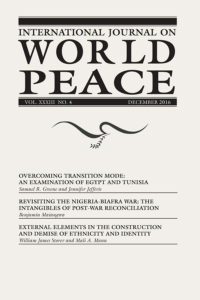 In some cases, the opposite results of what the Arab Spring promoted were created, for example the emergence of ISIS in Syria, Iraq, and Libya filling the vacuum of failed states. This led many to conclude that arming rebel forces, or attempting to occupy a foreign country, was counterproductive and that the refugees were the result of the policies of the Bush and Obama administrations and their allies. Many American citizens began to side with Russian President Vladimir Putin’s view that the Syrian regime of Bashar al-Assad should have been supported and humanized by improving human rights, rather than by arming rebels to topple the regime and creating chaos.